Let’s talk about leaveners, baby. One of the many things that I love about America’s Test Kitchen is that they often educate you about why your ingredients do what they do. To acheive a thin, crisp cookie, using two leaveners is recommended. Counterintuitive, don’t you think? One would assume that more leaveners would equal more bubbles and a more fluffy baked good. Wrong. As it turns out, doubling the leaveners creates huge bubbles that help the dough rise…. and then burst to help the dough fall (resulting in a flat and crispy cookie). 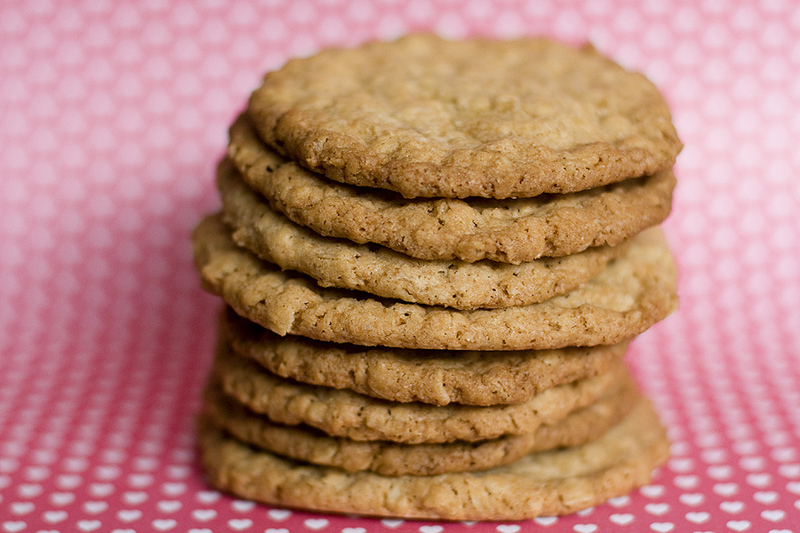 I hope you liked your semi-useless trivia of the day — now go make these delicious cookies! 1. Preheat the oven to 350F. Line cookie sheets with parchment paper. 2. Whisk flour, baking powder, baking soda, and salt in a medium bowl. 3. Beat the butter and sugars at medium-low speed until just combined, about 20 seconds. Increase the speed to medium and continue to beat until light and fluffy. Scrape down the bowl with a rubber spatula. 4. Add the egg and vanilla and beat until fully incorporated. Scrape down the bowl again. 5. With the mixer running at low speed, add the flour mixture and mix until just incorporated and smooth. With the mixer still running on low, gradually add the oats and mix until well incorporated. Give the dough a final stir with a spatula to ensure that there are no flour pockets and that the ingredients are evenly distributed. 6. Scoop about 2 Tablespoons worth of dough and roll between the palms of your hand to form a ball. Place the dough balls on the prepared baking sheets, spacing them about 2-1/2 inches apart (very important! these cookies are HUGE). Using your fingertips, press each ball into a 3/4-inch thickness. 7. Bake one sheet at a time until the cookies are deep golden brown — about 13-16 minutes; rotate the baking sheet halfway through to yield the best result. Cool the cookies thoroughly on a wire rack.